USS McCampbell (DDG 85) arrives in Ishinomaki, March 10. ISHINOMAKI, Japan - The Arleigh Burke-class guided-missile destroyer USS McCampbell (DDG 85) and Japan Maritime Self-Defense Force (JMSDF) destroyer JS Takanami (DD 110) arrived in Ishinomaki March 10 to pay homage and remember those who lost their lives and the many more who were displaced during the Great East Japan Earthquake and Tsunami on March 11, 2011. 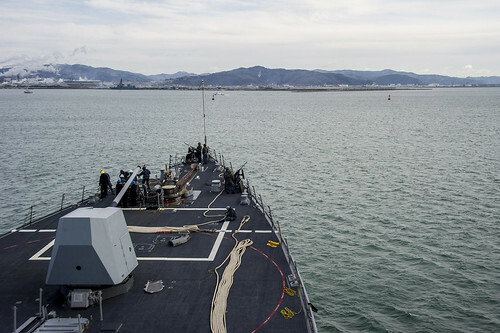 McCampbell's arrival marks the first time a U.S. Navy ship has visited Ishinomaki, since 2011, as well as the McCampbell's first opportunity to return to the area. "For many of the crew, this is an especially poignant and meaningful visit as a number of them were assigned to McCampbell in 2011, when she was the initial U.S. ship to arrive in the Sendai region to provide humanitarian assistance during Operation Tomodachi," said Cmdr. Sharif Calfee, McCampbell's commanding officer. "The fact that we can conduct this port visit jointly with our JMSDF counterparts only underscores the importance of the reason, which is to commemorate the 2011 earthquake and tsunami." Sailors from the ship will have an opportunity to attend a memorial ceremony to honor the fifteen thousand Japanese citizens who lost their lives and more than two hundred, seventy thousand who were displaced as a result of the tragic event. "As close friends and partners to the Japanese people, it's important for us to show our solidarity and respect in remembering this significantly devastating event," said Calfee. Additionally, McCampbell Sailors will have the opportunity to build relationships with the local residents through community service (COMSERVs) events as well as a basketball game, while also offering a view of Navy life through joint ship tours with JS Takanami. "COMSERVs are a very important aspect of any port visit and Ishinomaki is no different," said Calfee. "It allows us to demonstrate that we've not forgotten the people affected by this disaster and that we still care about them." McCampbell is part of the Forward Deployed Naval Forces on patrol in the 7th Fleet area of operations supporting security and stability in the Indo-Asia-Pacific.